Located at the heart of the University’s historic campus, Memorial Hall is CPA’s largest venue, home to theater and dance productions, orchestral concerts, and much more. Originally built in 1885, it was renovated in 2005 and reopened for the inaugural season of Carolina Performing Arts. In 1883, when lack of space in Gerrard Hall prevented adequate seating for commencement, plans were quickly drawn for a much larger building. This building would serve as a memorial to David Lowry Swain (former N.C. governor and past president of UNC), to other notable North Carolinians, and to the students, faculty and staff who lost their lives in the line of duty. Funds were raised by the sale of marble tablets commemorating those individuals and the Hall was dedicated in 1885. In 1929, it was discovered that the building was structurally unsound and the hall was condemned and razed. In 1931, the current building, retaining the name Memorial Hall, opened its doors with the original marble tablets covering the new walls. For more than 70 years, the building served the campus and community well. But as the University grew and the needs of patrons and performers evolved over time, it became quite clear that a major overhaul of the old cultural gem was necessary. 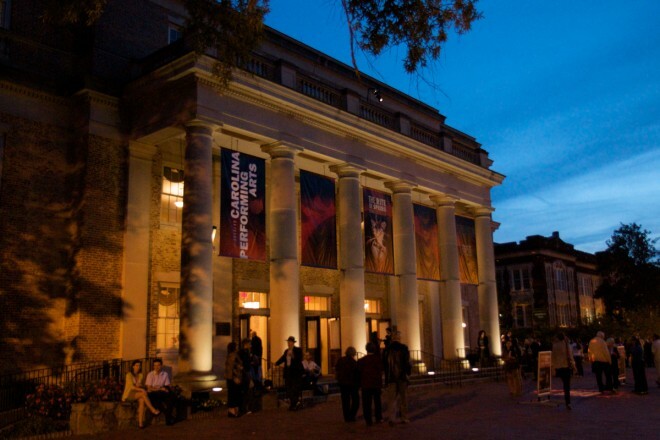 Memorial Hall’s doors closed April 20, 200 after the Clef Hangers spring concert and the three-year $18 million transformation began, funded through a partnership between the State of North Carolina and hundreds of generous donors. On Sept. 8, 2005, a ribbon-cutting ceremony kicked off the Grand Opening Gala weekend that included the N.C. Symphony, Tony Bennett, Itzhak Perlman, Pinchas Zukerman, Leonard Slatkin and Carolina Performs: A Student Performing Arts Celebration.